If your application has a multilevel menu with lots of child submenus then Dr.Explain is useful for quick documenting of your menus. If your menu is made in a native WinAPI or alike technique Dr.Explain's screenshot capturing tool will analyze internal structure of the menu and will automatically create series of screenshots with numbered callouts for each menu item. Look at the sample image below. Dr.Explain automatically walks through all your submenus and creates annotated screenshots for every child submenu like shown below. 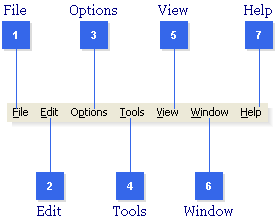 The same approach is used for context popup and dropdown menus. Such semi-automatic annotating allows you to save considerable amount of time.